Mix lemon juice, sugar, and water in the serving glass until the sugar dissolves. Add cracked ice or ice cubes and the Scotch. Stir to combine. Rub a piece of lemon peel around the rim of the glass, twist it above the drink and throw it in. Garnish with sliced pineapple, sliced oranges, and/or berries. 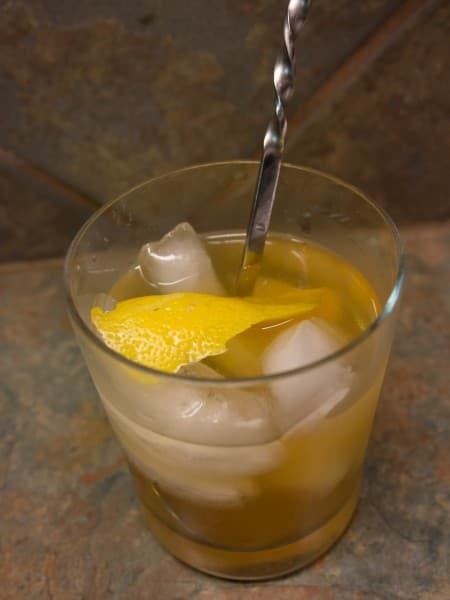 For the second, "fancy" iteration of this drink along the lines of Jerry Thomas's The Bartender's Guide 1887 Edition, add a teaspoon of Orange Curacao and back off on the sugar a bit. You may be thinking Scotch? In a Fix? I'll tell you it makes a very nice drink. The spice and peat from the Scotch peaks out, swimming in a fresh citrus/Curacao sea. This reinforces my positive experiences with Scotch in punches and toddies. I stripped down the mini-fruit salad garnish to only the lemon peel. I didn't want to cover up the nice Scotch with too much fruit. I also need to try this drink one more time in it's original mid-19th Century version without the Curacao - that would let the Scotch express itself even more. If you're freaking out about using a single malt Scotch in a Fix you're probably not alone. Try Dewars 12 year - that has been a good blended Scotch for me in cocktails. If you have another suggestion let us know in the comments.